This week Will has a quick word about the elevating aspects of music and how unifying musicality can congeal scattered parts into a greater whole. 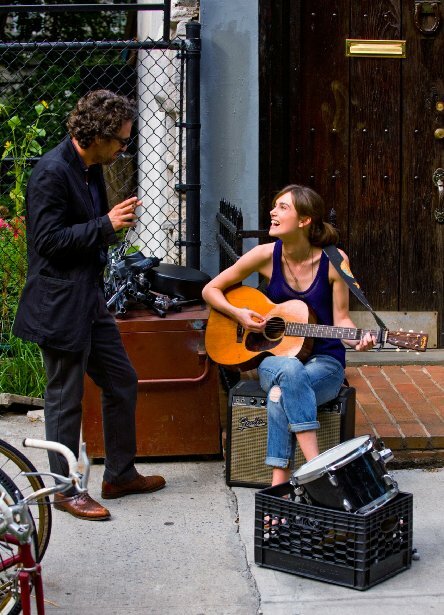 Begin Again may slip past the attention of most film-goers. In the wane of the summer blockbuster season that wouldn’t be hard. Plus the lack luster trailer isn’t helping much. But I’m telling you, if Once spoke to the heart on your sleeve, you should make time for this one too. 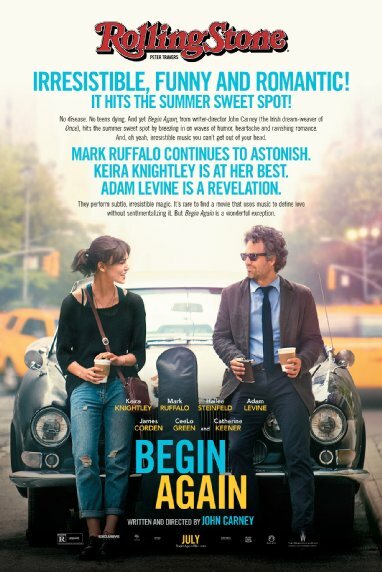 Begin Again stars: Mark Ruffalo as a washed up music producer losing his way; Keira Knightley as a brokenhearted English transplant who sparks music inspiration in Ruffalo; Adam Levine a musician on the rise leaving his emotional roots behind; and Catherine Keener as an estranged wife to Ruffalo. Although you may feel like have seen these pieces before (the perils of the music business / undefined relationship of a talented wayward man and an enlivening, museful woman / the rekindling of a fractured family),what sets this story apart is the music. There’s magic there. Even in the perpetual exhaustive haze of work and Independence Day weekend celebrations, I couldn’t help being transported by the spirit of this film. As the songs roll out, the film reaches another level. It’s a case where the whole adds up to more than it’s individual parts. The small flaws are forgiven by the greater weight of the musical journey. As they find inspiration, we too are swept up.This trick is exactly what this kind of film needs to succeed. Similarly, this aspect is exactly what propels Once to higher emotional heights. A lengthier conversation on the many positive aspects of both films could be had, but I wanted to leave you with one singular thing: the magic is in the music. John Carney gets this aspect right and everything else follows that musical hook. Without music, life would be a mistake. Begin Again is in select theatres now. Once (2007) can be rented or purchased on the usual digital outlets: google play, iTunes, YouTube, etc. And Once, the musical, runs at The Curran Theatre in downtown San Francisco until July 13th. Schwartz, Andrew. Still of Keira Knightley and Mark Ruffalo in Begin Again (2013). 2014. Photograph. IMDB.comWeb. 8 Jul 2014. Weinstein Company, Begin Again One Sheet. 2014. Photograph. IMDB.comWeb. 8 Jul 2014.